They made their way across the vast oceans, leaving behind all they knew; family, friends, land, their furniture, and most of their personal belongings. They were going to a strange new land, far away and into a wilderness which was wild and full of savage Indians. As they crossed the oceans, most of them were only allowed a minimal amount of space to bring their most valued possessions. 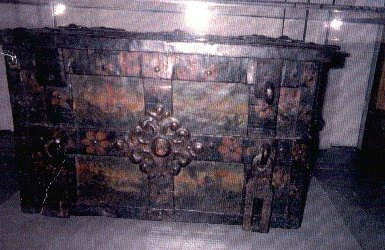 This meant only what they could stuff into a big chest, one made in a sturdy manner to handle the rough handling of the journey. And so they came. And with only their chest full of their few meager possessions, but ready and willing to start a new life. Gift of Mrs. Norman Grey in memory of her son, Andrew Sinnickson Grey. 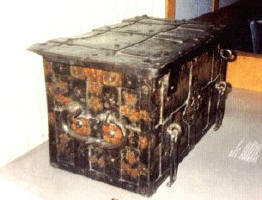 This Sinnickson Family chest may have come from Sweden as early as 1638 when Anders Sinicka and two sons, Broors and Anders, came to America with Peter Minuit. Note the painted decoration of flowers, sea and landscaptes, wrought iron end handles, foliated escutcheon and intricate lock. 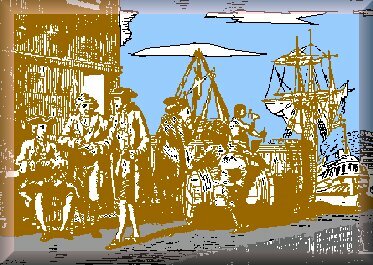 Brought to New Sweden on the Delaware by the first members of the Sinnickson Family to settle in this country. Presented to the American Swedish Historical Museum by Mrs. Norman Grey in memory of her son Andrew Sinnickson Grey 1911-1938. Although the above two inscriptions accompany the chest as shown in the photograph and which is on display at the American Swedish Museum, Franklin Delano Roosevelt Park, 1900 Pattison Avenue, Philadelphia, Pennsylvania 19145 it has in recent years been brought to our attention by various researchers that the progenitor of this family was one Sinnick Broer who arrived circa the mid 1650 era, rather than the earlier 1638 date. He had sons Broer, Anders and Jan. No information to date is available for any wife. A daughter, whose name remains unknown to us, although she was married to Hendrick Jacob Falkenberg. One known son, Henry Falkenberg, was born of this union, no further information is available, or known of, this daughter of Sinnick Broer. FAMILY OF SOUTHERN MISSISSIPPI by Adrianne Fortenberry Criminger. May 9, 1998, commissioning day for the new Kalmar Nyckel in Wilmington, Delaware. Courtesy of The Timen Stiddem Society Newsletter Issue 2 / Summer 1998.